Register Log In Home Forums General and Off Topic Latest Walmart visit. Dropped by Walmart. 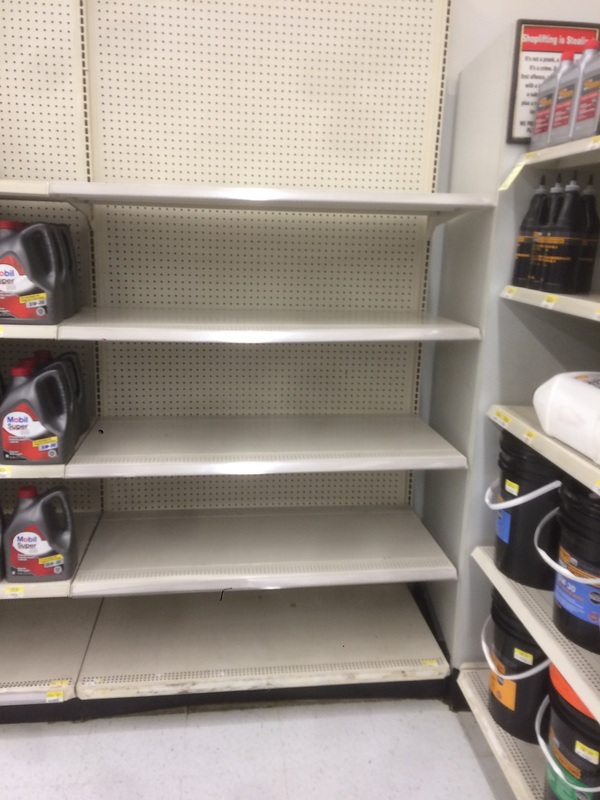 Here is a shot of empty shelves this store keeps. Also, I noticed a disturbed Tough Guard oil filter box and lo and behold, there were six empty boxes that used to contain cartridge filters. Crazy. Last edited by Snagglefoot; 02/28/18 12:33 AM. Stealing filters is nuts. Before long they will have plastic cages for the filters just like the ammo and video games. That is a lot of space! The auto store down the road put all the oil filters behind the parts counter. You ave to ask for your favorite filter. Walmart loses 3 billion (that's right 3 billion) due to theft each and every year. "or 1% of its $300 billion in revenue"
Curious to see smaller stores figures. -- lo and behold, there were six empty boxes that used to contain cartridge filters. Crazy. Yep, can't detect the cartridge filters on the way out. People have no integrity these days. Last edited by JLTD; 02/28/18 06:21 AM. My nephew bought an Xbox One and 4 games at Christmas at Wal Mart. He got home, unwrapped the games from their plastic containers, which were sealed in plastic, just like they should be, and there were blank DVD's in them. He took them back, and Wal Mart refused to exchange them, even though they acknowledged that this has been a problem. I told him to have his credit card company take care of it, but he's just too mild mannered and ate the loss. Fast forward, a week ago in Michigan, I stopped and bought my son a Nintendo Switch game. Like an idiot, I forgot about my nephew's deal, and didn't open it at the cash register. No game cartridge. I took it back in and they apologized and quickly exchanged it. The theft is getting more sophisticated. I'm not sure if it happened at the factory or the distributor, but those games were all wrapped just as they would be from the factory. It amazes me how dishonest people really are, and the effort they'll expend to steal instead of putting that effort into honest work and earning their way. I caught a kid reaching into my tool bag and walked him to the door. He said, "It was there! ", as if it was a defense. And only $13 billion in net profit. Meaning that 1% of revenue would be another 25% in profit. They operate on some pretty tight margins, just over 4%. People claim Wal*Mart is evil because they make so much money. There are others who make far more on each dollar of revenue who are not branded as evil. Every time I go in that place I am simply amazed at the mutants lurking about. It�s no wonder they have somebody standing right in front of the door. I ventured into the one in Homestead Florida a few years back. They had the person in the door security in the golf cart in the parking lot and her uniform cop parked right in front of the door . This is why I always check the packaging before I walk away. It is sad to see that this is happening. I wanted to buy a bunch of the clearance ST filters and found myself checking each box to see if there was actually a filter in it. I'm sure the guy monitoring the camera was very interested in me at that moment. That is if there really is a camera like the sign says in that isle. YES the stores do have advanced cameras everywhere. However, in my experience, the asset protection / security department spends much more time watching employees than customers. Employees are the biggest single source of pilferage.